The Federal Highway Administration has come out with a handy report [PDF] for communities thinking about getting into the bike-sharing game. Based on a study of 12 planned and existing bike-sharing systems from around the U.S., the report is intended to help explain the basics of bike-share and guide cities through the choices they’ll face when launching a system. While the specific advice isn’t exactly groundbreaking, the mere fact that the FHWA has produced the guide indicates that bike-sharing is becoming increasingly common in America. All of the lessons collected in the report come from U.S. cities, not from the world’s leading bike-share systems, which limits the document but perhaps makes the idea of bike-share seem more attainable to other American cities. Among the existing bike-share systems examined for the report, Washington DC’s Capital Bikeshare is the largest, with about 1,700 bikes and 175 stations currently. By comparison, Montreal’s Bixi has 5,000 bikes, and London’s bike-share system has about 8,000. Here’s a look at what the FHWA is telling prospective bike-share cities. Having quality bike infrastructure in place helps, but you don’t need it to have an effective bike-sharing system. Small systems can be successful even in low-density cities. Helmet use should be encouraged, but it should be up to the individual to provide their own helmet. 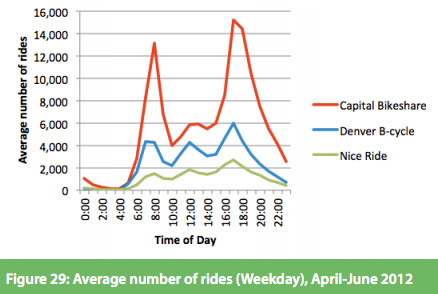 Crash rates for bike-share users have been low overall. Gaining strong political and financial support is a must. Bike-share stations work best in areas where there are mixed land uses, i.e. retail, office and residential. Higher use bike-share stations tend to be located in higher-density, walkable areas. Serving low-income and minority populations remains a challenge. I just had my first chance to use a bikeshare system this last weekend in Boston. First off, kudos to Boston for making a bikeshare system easy not only for locals but also tourists to use. We were in Cambridge and wanted to return to our hotel in the Back Bay area. We could’ve taken the T for $2.50 (that’s how we got there) but we had spotted a bikeshare station and we’d also seen a station 2 blocks or so from our hotel. At the Cambridge bikeshare station there was a map showing we could take a bike path along the Charles river most of the way (4.5 miles.) We guessed it would take about half an hour (the limit of the usage before extra fees would be incurred.) The T would’ve been a little quicker but also hot, loud, and crowded. It was a beautiful day. The river beckoned. We chose bikeshare! Boston’s Hubway system was relatively easy to figure out, make payment, get the bikes out and return them. And the bikes weren’t bad. They had a basket-like thing in the front with a bungee-like-cord to secure cargo, three gears, led lights front and back, easily adjustable seats, and they didn’t ride too badly. Maybe I wouldn’t attempt 20 miles on them, but for 5 they were fine. I give Boston’s Hubway system an A-! We wouldn’t have chosen to use the bikes had we not seen a bikeshare station near our hotel, had there not been a large map of the area’s bike lanes for us to pour over at the bikeshare station, and also had we not done an 11 mile, 3 hour bike tour of Boston with a bike tour company the previous day so we had some sense of how to bike in that city. Even so, I was disappointed with Boston’s bicycle infrastructure. It rates a D+, in my opinion. For comparison, I give San Francisco’s bicycle infrastructure a C-, Seattle’s a D (even though,yes, the Burke-Gilman trail is phenomenal), Berlin’s a B, Vienna’s a B+, and Amsterdam’s an A-. (Even the Dutch admit Amsterdam is not up to best Dutch bicycle infrastructure standards.) In general, when it comes to bicycle infrastructure, most of the US ranges from D- to F, in my opinion. Maybe even F-. So what makes a good bike share system? Has anyone at the FHWA actually used one? 3) If the traffic is absolutely horrendous and there is no separated bicycle infrastructure to speak of, forget most people using a bike share system. What is horrendous traffic? Traffic that is loud, traffic that goes over 30 mph, traffic that passes by with little break, drivers who are aggressive and generally unsympathetic to bicyclists. And let’s be clear: sharrows are not bicycle infrastructure, unless they are on very calm, low-traffic streets! (Sharrows on high-traffic streets are just cruel, perverse jokes.) Bike traffic physically separated from horrendous car traffic is bicycle infrastructure. If the car traffic is 20-25 mph, intermittent, and drivers are calm and patient, then yes, bikeshare without infrastructure can work, but the only cities I’ve seen where this might be the case are the old part of Charleston and the Garden district and French Quarters of New Orleans. (I do hope New Orleans gets a bikeshare system. I longed for a bicycle when I was there.) Tourists who don’t know any better may toodle around on a rental bike not realizing how dangerous the road they are riding on is (I see this all the time in San Francisco–I pray for these people), but locals know and won’t risk it themselves. For bikeshare to work, biking needs to be convenient and pleasant. For any city or town considering putting in bikeshare, convenient and pleasant should be their mantra. To test out if they’ve achieved it, they should get their grandmother to go for a spin and see what she thinks. See if you can spot the one person pictured in it who is holding a share-bike *without* wearing a helmet!